The Powertec range of 18 tonnes to 26 tonnes chassis skip loaders have a safe working load capacity of 14 tonnes to 18 tonnes. 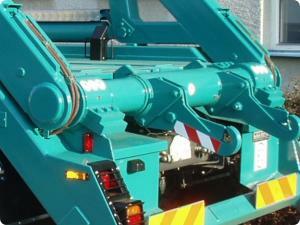 The skip loaders are built for safe and easy operation along with strength, durability and reliability. 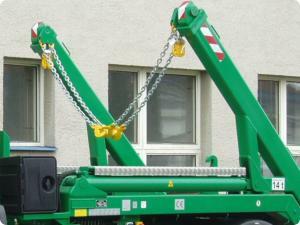 This Skip Unit can be fitted to any chassis of your choice and comes as standard with independent extending arms and independent rear stabiliser legs. 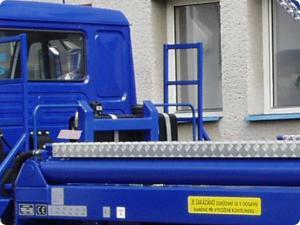 Powertec Vehicle Engineering Ltd are pleased to announce the launch of the new Powertec 12-T-PT Skiploader which is suitable for fitting to most manufacturers 18000kg GVW Chassis. Designed to CHEM standards the equipment is fitted with many extra features as standard. The equipment has been designed using the latest technology and materials, resulting in a superior skip loader with increased strength and lower equipment weight.